I have been missing in action for most of this week. Life has been very busy but very productive. I’m tired out from all of this, but happy nonetheless. I couldn’t miss out on Snapshot Saturday though. When you’re finished here, be sure to stop by at West Metro Mommy Reads to catch all of the other great photography that you’ll find there. I haven’t been taking many photos lately but I did have the chance to capture this sunset. It was the most unique combination of colors. I wasn’t sure it would translate into a photo but I think it turned out pretty well. This post is really on the fly today but I didn’t want to miss the chance to join in. Be sure to check out the other great photographers at West Metro Mommy Reads. 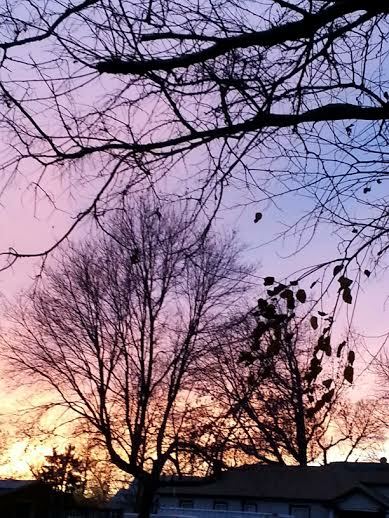 Beautiful colors in the sky in your photo! Thanks, Amanda and thanks for visiting my blog! Thanks, Arti! I like your idea for the book cover. Thanks for visiting! You are right…such a unique combination of colors. It’s gorgeous! Thanks for sharing…and for visiting my blog. Thanks as always, Laurel! Have a great day! Love sunset photos – a great ending to the day! Sharon, sunsets and sunrises are my favorites. Thanks for visiting! Thanks, Bob! Hope you had a great Thanksgiving! Our sunsets in New England have been spectacular too! Love those pinks and purples! So dramatic! Glad you liked it Susan! Thanks for visiting. Sunset photos are tricky- this one has such beautiful pastels, and then the ball of fire. Lovely. Thanks, Louise. I was happy with it. Thanks for visiting. Thanks so much, Brona and thanks for visiting! we had lovely sunsets to capture here the past couple of days.. i have enjoyed them thru my friends’ cameras.. and now yours too..